Black Stallion Winery is located in the Oak Knoll District, a grape growing region in the southern half of the Napa Valley. The name Black Stallion pays homage to the rich history of the 32 acre estate which was once home to the Silverado Horsemans' Center. The equestrian center featured an indoor riding track, numerous training rings, breeding facilities and an outdoor arena that seated 3,000 spectators. After more than two years of construction, Black Stallion Winery opened its doors in 2007. The indoor track now houses winemaking production but remnants of the original horse stalls are still visible today. In 2010, Black Stallion Winery was purchased by the Indelicato Family, one of the leading family-owned wine producers in the country with the third generation active in continuing the tradition of producing fine wines. Black Stallion Wines are crafted in small case lots available at the Winery. 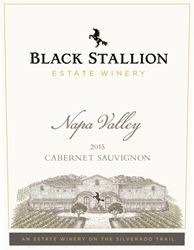 Nationally, Black Stallion Estate Winery Cabernet Sauvignon and Chardonnay are available in fine wine shops and restaurants. Exquisite and warm tasting room and gift shop with soaring ceilings, custom wood finishes and large tasting bar. Several venues for private and corporate events. Music in Tasting Room: An interesting selection of background music. To join the wine club, visit www.blackstallionwinery.com or call 707-227-3250. Membership consists of either our Mixed, Red, White or 2 Case Self Directed Clubs. Once membership is activated you’ll receive 4-bottle shipments four times per year with the chance to enjoy many membership only benefits. Membership costs nothing to join and you may cancel membership at anytime after your second shipment. Our ultra-premium Bucephalus Club is now available with shipments twice a year in 6 bottle quantities and includes all wine club membership opportunities with additional benefits. Complimentary tasting, 10 percent off purchases and discounted pricing for tours and events.